Call or Text for a Quick Accurate Quote! We take pride in our work and are always on time–EVERYTIME! Centrally located to service all counties in Western Washington. 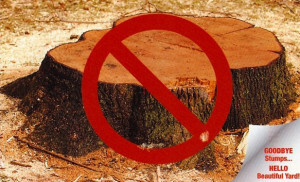 Stumps are ground into fine chips which are attractive, enrich the soil, and reduce impact on landfills. Affordable with convenient payment options. We accept cash, check, or credit cards. Stump grinding probably costs less than you think. To prove it, let us give you a quick quote. A combination of experience, efficiency and good equipment allow us to minimize your stump removal cost. We pride ourselves with having excellent customer satisfaction and much of our work comes from referral. 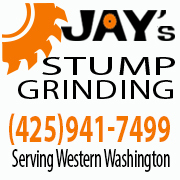 Jay’s Stump Grinding Service can handle any size and quantity of tree-stumps and we can reach them in difficult or tight areas. We take pride in our quality work and immaculate clean-up. When you hire Jay’s Stump Grinding you can expect an operation with careful regard for safety. Our experience and professional equipment pair to ensure there will be no damage to your house and property. We Really Get Around The Sound! Text or email us a picture of your stump along with an object for size reference and your location for a quick quote! We will respond promptly. Feel free to leave us review. Get A Faster & More Accurate Quote By Sending Us A Pic! Or Skip It And Just Send The Form.